Digital verses Offset – which is better? Offset printing is very cost effective when the print run is longer and consists of many prints with the same content. When the print job has low quantities of many different images – digital printing becomes more advantageous. There are 2 reasons for the difference. The first reason is in the cost of initial setup. An offset press requires film, plates, make ready sheets and setup time before the job is ready to run. The cost of the prints themselves are quite low, once the setup is complete, making longer runs more cost effective. The second reason is, a digital press has no film or plates and can usually be ready to run with a small amount of setup sheets with minimal operator time. 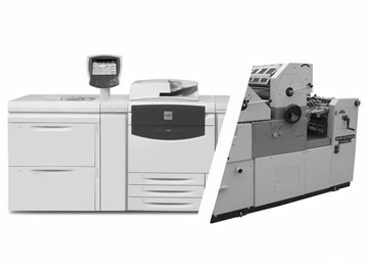 The cost of the digital prints are high, therefore, long runs are not effective, unless they are outweighed by the higher cost of the setup on the offset press. For example, a flyer with 5000 copies would be a good candidate for offset printing. However, 50 copies of a book with 100 sheets per book, would have a total of 5000 pages, but not cost effective for offset printing. This is due to the high set up cost of the offset press for 100 different sheets which outweighs the greater expense of the digital press prints.